Spiritual bypassing — the use of spiritual practices/beliefs to avoid dealing with painful feelings, unresolved wounds, and developmental needs — is so pervasive that it goes largely unnoticed or is only superficially considered. 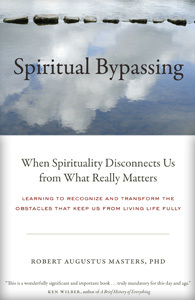 In the tradition of the landmark book Cutting Through Spiritual Materialism by Chögyam Trungpa, Spiritual Bypassing casts a lucidly critical eye on our deeply entrenched misuse of spirituality, furthering the body of psychological/spiritual insight into how we use — and abuse — spirituality. A must-listen for anyone seeking increased self-awareness and a deeper, more spiritually sound life, a life of full-blooded integrity and compassion, a life in which the personal, interpersonal, and transpersonal are all honored and lived to the fullest, a life in which we cultivate intimacy with all that we are.